Simon Farnaby at the 2011 Children's BAFTAs. 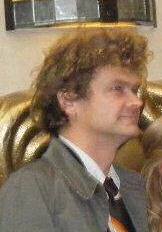 Simon Farnaby (born 2 April 1973) is an English actor, writer, and comedian. He was a principal cast member of Horrible Histories, Yonderland, and the film Bill. He has written and starred in films such as Mindhorn and Paddington 2, and in the BBC sitcom Detectorists. Farnaby was born in Darlington, County Durham. Farnaby is a long-time member of The Mighty Boosh supporting cast, having had roles both in their series and co-starring in the quasi-spinoff film Bunny and the Bull. He is also well known for his similarly offbeat characters in the CBBC live-action series of Horrible Histories, such as Caligula and the Grim Reaper. Other notable television work includes a recurring role on the sitcom Jam & Jerusalem and co-starring as eccentric neighbour Sloman on The Midnight Beast's TV series. He previously had a very brief role in Coronation Street in the 1990s. Along with journalist Scott Murray, Farnaby co-wrote The Phantom of the Open, a biography of Maurice Flitcroft, a would-be professional golfer whose unsuccessful attempts to qualify for the Open Championship led to him being described as "the world's worst golfer". The book was published in 2010. Along with the five other principal members of the cast of Horrible Histories, Farnaby is also the co-creator, writer and star of Yonderland, an eight-part family fantasy comedy series that premiered on SkyOne on 10 November 2013. The show ended in 2016, with three series and a Christmas special. He co-starred with the same troupe in Bill, a 2015 BBC comedy film based loosely around the early life of William Shakespeare. In 2013, Farnaby presented a documentary entitled Richard III: The King in the Car Park, tracing the discovery and identification of the remains of the last Plantagenet king. The next year, Farnaby presented another Channel 4 documentary series entitled Man Vs Weird, in which he travelled the world investigating people who claim superhuman abilities. In mid-2014, Farnaby narrated a series on Channel Five called On the Yorkshire Buses, following East Yorkshire Motor Services. L-R: Simon Farnaby, Martha Howe-Douglas, Mathew Baynton, Laurence Rickard, Ben Willbond and Jim Howick at 2011 Children's BAFTAs. In 2016, Farnaby co-wrote Mindhorn with Julian Barratt, a comedy about Richard Thorncroft (Barratt), a faded television actor drawn into negotiations with a criminal who believes his character Detective Mindhorn is real. Farnaby also has a small acting role as Clive Parnevik. In December 2016, Farnaby had a small cameo in Rogue One, as an X-Wing Pilot. In February 2017 Farnaby stated that he was working on a film script based on his biography of Maurice Flitcroft. In 2017, Farnaby co-wrote Paddington 2 with Paul King. Farnaby had a small role in both the first film and its sequel. It was announced that the original Horrible Histories cast (including Farnaby) would reunite for a film based on the series. Horrible Histories: The Movie is set to go into production in 2019. Farnaby is married to actress Claire Keelan. On 10 November 2013, in a Radio Times article about Yonderland, it was revealed that Farnaby was about to become a father. Farnaby's daughter Eve was born in 2014. Her age at the time and her name were revealed in a 2017 article by The Scottish Sun about negative reaction Farnaby received after portraying a Scotsman. ^ a b Richardson, Jay (24 February 2017). "The world's worst golfer, coming to cinemas". Chortle. Retrieved 14 July 2018. ^ "Sky1 to visit Yonderland". Sky1 website. 13 May 2013. Retrieved 26 July 2013. ^ "Stars of Horrible Histories to make Shakespeare film". BBC Media Centre. 22 March 2013. Retrieved 26 July 2013. ^ "Bill: production details". British Comedy Guide. comedy.co.uk. Retrieved 12 February 2014. ^ "On The Yorkshire Buses". Ear ache voices. Retrieved 7 August 2014. ^ Armstrong, Stephen. "Yonderland: We wanted to raid the dressing up box and speak in silly voices". Radio Times. Immediate Media Company Limited. Retrieved 22 April 2016. ^ Bendoris, Matt. "A DODGY HISTORY Horrrible Histories star Simon Farnaby reveals his attempts at playing a Scot led to complaints about the show". scottishsun.co.uk. Scottish Sun. Retrieved 15 August 2017.